As I selected my classes this semester, I felt a pressure to look for ones that would somehow encapsulate my "Princeton Experience"
For many of my friends and classmates in the Class of 2019, next semester—our last semester—unlike previous ones filled with distribution requirements and departmentals, is an opportunity to explore new, exciting courses, disciplines and departments. For the first time since first-year fall, I have no pressing requirements to fulfill or prerequisites to complete. Having completed all of the requirements for my department, certificates and Princeton’s distribution requirements, I had the opportunity to take literally whatever I wanted—and I had no idea what I wanted to take. The fact that I will only take three more classes at Princeton (EVER) made my course selection choices feel incredibly urgent and incredibly important. The seven other semesters of classes that I have taken at Princeton have undoubtedly contributed equally to my overall sense of intellectual fulfillment here. However, as I selected my classes this semester, I felt a pressure to look for classes that would somehow encapsulate my "Princeton Experience" or capture the spirit of my time here. 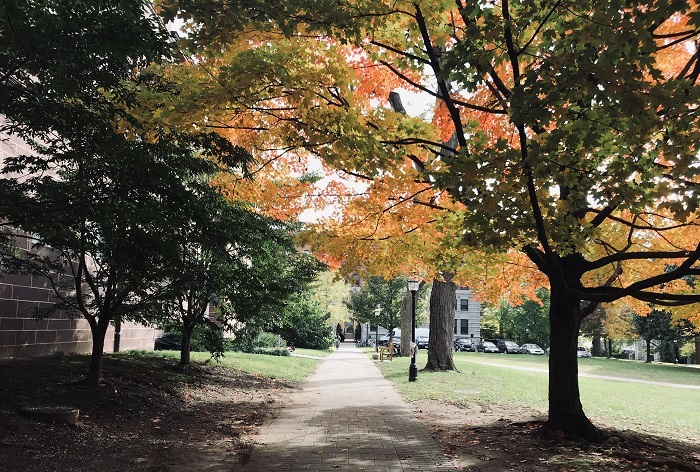 Due to the thesis requirement, seniors in most departments are only required to take six classes throughout their last year—students can choose to take four courses in the fall and two courses in the spring or three courses each semester. As many of my senior friends and I perused course offerings, we turned to each other, seeking recommendations for classes that could provide us with a sense of fulfillment in our last semester. For some, this meant seeking relatively stress-free classes that could enable them to enjoy all of parts of Princeton outside academics: dance classes like “Introduction to Hip-Hop Dance” or “Stillness”, art and art-making classes like “Digital Photography” or “Drawing I”, or truly unique, fun-spirited classes like “Radioactive: Wakka Wakka,” which offers students an opportunity to study “puppetry, live animation, and optical illusions,” offered by the Princeton Atelier program. Others sought classes in uncharted territory, signing up for ones far outside of their disciplines and areas of study—classes that they had always been interested in, but had never had the chance to take. I asked my friends about their favorite classes and professors, I reached out to friends who have graduated recently to hear about classes they regretted not taking and I listened to my first-year advisees discuss the classes they were most excited about, before passing on my own recommendations to them. My senior fall semester was one of my favorites at Princeton. I was challenged by my courses but also exposed to wonderfully interesting material and amazing opportunities (like going to see Hamilton with one of my classes!). I appreciated the balance and intellectual fulfillment I found. However, the semester also set a high standard for my final days at Princeton. Seeking to maximize a similar combination of interesting but challenging material, new disciplines and amazing faculty for my final semester while still leaving ample time to complete my thesis, I decided on four classes that I will “shop” in spring to decide on the three classes I’ll ultimately take: "Supply-side Aesthetics: American Art in the Age of Reagan", "US Foreign Policy and the Middle East since 1979", "The Arab-Israeli Conflict", and "Communism and Beyond: China and Russia".